In addition to our concert appearances, we have recordings of our work. Please click the links to learn more about each CD. Our CDs are always available at our concerts, and online from CDBaby. They are also in selected outlets in the Pacific Northwest including Music Millennium, Beacock's Music, Clark College Bookstore, Sheet Music Service, and Whitman College Bookstore. 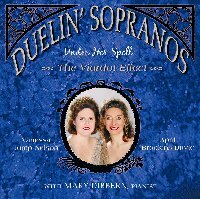 The Duelin' Sopranos, featuring Mary Dibbern, pianist, present twelve duets and six solos written/arranged by Pauline Viardot and the composers that came under her influence. The collection includes poetry by many of the wordsmiths of the day, such as Victor Hugo, Alfred de Musset, Théophile Gautier, Victor Wilder, Alphonse Daudet, and Romain Bussine. Several of the songs were written for her daughters, Marianne and Claudie. Composers represented include: Johannes Brahms, Frederic Chopin, Gabriel Fauré, Camille Saint-Saens, Hector Berlioz, César Frank, Claude Debussy, Léo Delibes, Charles Gounod, Maria Malibran, and Pauline Viardot. This CD was a finalist for Best Album in the category Opera/Classical Vocal for the 2004 Just Plain Folks Music Awards. DS 101 - 2002 - Christmas Joy! This is Duelin Sopranos' first CD release, and what fun! Recorded in the late summer sun, it was ready in time for celebrating the holidays with our favorite Christmas songs. Some of the favorites include "I Wonder As I Wander", "Il Est Ne le Divin Enfant", "Angel Carol", and the premiere recording of Vijay Singh's "What a Night That Must Have Been". Paulette Hanchett, pianist and Viorel Badiceanu, flutist. "This is magic time. Imagine that you have an angel on each shoulder, and that they both possess pure voices of satin that lift and intertwine in ethereal beauty on classical holiday selections. You have just imagined Christmas Joy. ..."